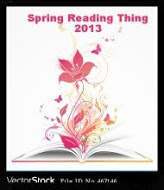 Welcome to Spring Reading Thing 2013! I am thrilled to be filling in for Katrina at Callapidder Days as host for this stress free reading challenge. I hope you enjoy each of the books you have chosen, as well as checking out what others are reading. You may begin reading on the 20th! The challenge goes from March 20th to June 20th. Write a post about your challenge experience in June, telling us all about your experience and whether you reached our goals. REMEMBER: this is a low-pressure, stressfree challenge that should be fun. As long as you do some reading this spring (and enjoy it!) that's good enough for me. There is a Mr. Linky at the end of this post. Please use it to link to your blog post containing your Spring Reading Thing list. Remember to link to your specific post, not just your general blog homepate. People will be stopping by for days or weeks!) and when you link to your specific post, it will make it easier for everyone to find your reading list. Also, if you don't mind, please link back here from your post so that your readers can come check out all the other participants. That's it. I'll randomly draw the winners shortly after the end of the challenge. Note: There is NO limit to when people can sign up to participate in Spring Reading Thing 2012. You're welcome to join in any time between now and June! The "deadlines" mentioned in the above prize section are only for prize eligibility. You may begin linking up. I just found your post so I need a day or so to get my list ready and get a post together, but I'll be back to link up. I've never seen this challenge before so I'm glad I saw your post! Thanks again for hosting this for us. So glad to see so many participating. Thank you so much for joining. I participate in this and the fall challenge every year so I couldn't let it slide by. My students also participate. Since they don't have blogs they will be participating through our school's Edmodo. If you aren't familiar with Edmodo it is kind of like Facebook for schools. I post assignments, etc. on there. They can talk back and forth like they do on Facebook. The difference is I can set them to "read only" if they don't follow the rules. I may give you the access code to the Spring Reading Thing Group I created for them for this Challenge. I haven't decided yet. Have fun and start reading. Looking forward to the challenge again. I'm participating in Bloggiesta and now don't even remember how I found you but alas I had to join in. Look forward to seeing what's on everyone's to read list! My son's science teacher uses Edmodo but not for Language Arts. Glad to have found your blog Sandra! Thanks to all for your vote of confidence. I look forward to this every year. Tanya, I'm glad you found me. I haven't participated in Bloggiesta in a while. Maybe next time. Edmodo was a way for my students to officially participate and not have to worry about strangers. I've told them that as they post responses/summaries to what they read I will occasionally share some. Giving this a shot again this year. Thanks for hosting! Thanks for hosting - and the friend add on Facebook! I'm reading every time I get a crack in my schedule. I hope all of you have gotten of to a wonderful start. Sorry guys, I had to activate the comment verification to stop spammers. Thank you so much for hosting this awesome challenge! I heard about it yesterday on one of my blogging related Twitter chats and am eeking in my entry just under the prize deadline! As you can see I have a busy reading schedule ahead of me over the next few months, so this challenge could not come at a better time! Look forward to getting to know you better as we share our mutual love of books! I'm so excited! Thanks for hosting!! I am very excited! Although late I am here! Thanks for hosting! This is a new challenge for me--happy reading, everyone! I picked on 10 books I want to have read by June hope I'm able to complete them all. Anyways, my friend gave me a book to read last week "Wild: from lost to found on the Pacific Crest Trail" by Cheryl Strayed. If you all get a chance, you ought to find it and read it. This book has moved me more then some others I have been reading. http://www.cherylstrayed.com/wild_108676.htm check it out at this link.